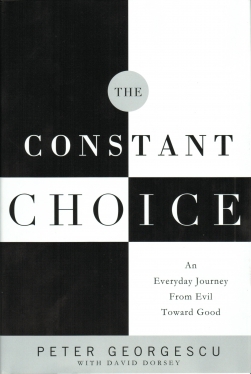 I must admit I am rather surprised how much I actually enjoyed the book The Constant Choice by Peter Georgescu. At first sight, this book seemed not for me: Another book filled with strong anti-communist messages and resentment by a CEO and chairman emeritus of Young & Rubicam Inc. who was probably going to extol the fairy-tale virtues of the American dream. This is a memoir written by a successful and retiring CEO, and what would they know about pain and suffering, what knowledge could they possibly have about the existence of evil, and also why should we care about what they think in the first place. It might be simply a work of contrition to purge their own evil ways and to unload their heavy burden of conscience. On a literary level, the book is somewhat uneven. It mixes facts with ideas and switches between recording and sharing life experiences and Georgescu's own present observations and thoughts on the main events and decisions surrounding his life. At times it feels like fiction as he often jump-cuts from the present to his difficult past in a forced labor camp in Romania. However, I am not holding its literary and at times philosophical demerits against this work. It is indeed a book written not by a professional writer, scholar or philosopher but foremost an honest and goodhearted human who wants to share his life story, ideas and observations. His philosophy of choosing and doing good may be simple, but it is effective and often overlooked in daily life. Georgescu may not have studied philosophy extensively, but his acute observations and his general knowledge offer enough satisfying food for thought. More importantly (and somewhat unexpectedly) here is someone with whom I fully agree, well let's say about 87.5% of the time. His ideas are in very close vicinity to my own views and perceptions of life, religion and philosophy. For instance, Georgescu believes in a higher power (let's call it God) but this entity is not hindered by restrictions and limitations generally set upon it by organized religion. In other words, God is not enslaved by the narrow-minded dogmas of those who officially profess to know Him well. Throughout his life, Georgescu has had to adjust his own beliefs ranging from a fairy-tale-version of God that comes to the rescue of the good and suffering people on Earth, Jesus at its helm slaying dragons with his sword, to a belief that God and with it all existence on the planet is much more complex and intricate than that. However, with irrational fervor somewhat reminiscent of Pascal and Kierkegaard, he still holds onto the existence of God against all (scientifically) visible odds of the universe. But life has given him some hints of the other world. It happened when the Gypsy fortune-teller against all logical odds predicted the exact release date of his imprisoned father in Romania. It also happened to him during meditation sessions following the Silva technique (a technique I am curious about but need to brush upon myself before making any comments on it) where he had a glimpse of knowledge outside of the self and the realm of personal experience. Put differently, Georgescu has had visions that do not concord with logic. Some people may dismiss them as fantasy, inaccurate recollection or what-have-you. Those people are stubbornly fighting against a view that is not congruent with their rational construction of the world in which irrational happenings are seen as a virus or a termite that can make their whole artifact collapse onto itself. But such bugs and glitches exist already in science when it comes to seemingly preposterous ideas of quantum physics involving cats that are both dead and alive, electrons that are both waves and particles, or more astoundingly the mind-boggling string theory that involves multiple dimensions folded upon each other. In either case, such an existence of other dimensions to our existence cannot be comprehended by logic alone; it needs the basis of experience, and I must say I fully believe and support Georgescu's account of the existence and occurrence of such supernatural phenomena. Apart from our general religious and spiritual overlap, Georgescu is equally naive as me (though I dare say not wrong) in his view of the world. We both think that there is ultimate justice (call it divine or poetic) and that the best philosophy is to be and do simply good. These good and constant choices add up over time and may even change the genetics of the person in question, an idea that the author explores to some extent under the scientific banner of epigenetics. Whenever people act with malice or evil intentions, we feel disappointed. Why people would not embrace the good and let their greed or ambition get in the way seems baffling. To me it does seem an oxymoron to have a morally “good” CEO, but it seems that he has achieved his position through a balanced mix of luck, hard work and well-intentioned, caring and supporting people, to whom he refers as his guardian angels on Earth. Georgescu does not strike me as a ruthless person, but as someone who has an interminable work ethic and an insatiable drive for success and perfection. Yes, he strikes me as ambitious (and there is nothing wrong with that); at the same time, he is modest since there is little bragging on his side concerning his position, status and power. Nonetheless, I am somewhat surprised how someone with his sensitivity should survive so long and successfully in the cut-and-throat business world of advertising. It must be said that it has taken a toll on his health, in terms of stomach ulcers and sleepless nights. However, he is fueled by his childhood and later life experiences. In forced labor camp, work was equated with life and death (much more so since apart from being physically demanding, it also entailed elements of life-threatening danger when he would work with dangerously wired switches in Communist Romania). Later, he felt gratitude for his host country, the United States and felt compelled to work hard and prove himself worthy and of value in this land of opportunities. But throughout it should not be forgotten that he originally came from a privileged and respected family back home. This also explains the wrath and envy of the Communists and them taking it out on Georgescu and his brother, while the parents had left the country and were working abroad in an oil company in the United States. At this point, Georgescu makes two philosophical assumptions I disagree with. First, he claims that actions although undertaken with good actions can be bad. Case in point are his grandparents who insist that he and his brother should stay back with them in Romania instead of joining their parents. It is true that it was the wrong decision, but I think that intention regardless of outcome defines morality. If we look at the morality of consequences of actions alone, we might accept the dangerous Machiavellian concept of means justifying the end. To blame the grandparents for their love may be a case of selfishness, but it is not a moral issue here. The second point is when it comes to Georgescu's parents. They are professed as good and caring, but in my view they are not. When their children were suffering in Romania, they supposedly spent a lot of money to get them out of there, but they never went there in fear for their own safety. Yet when the communists contacted his father with a proposition that they would free his children if he agreed to spy for them, he, and it seems without hesitation, rejected the proposal. Here we have a conflict of morals, treason of a country versus the safety of his children. Georgescu extols his father for making the right choice. But as a father myself, I could not disagree with him more on the matter. I believe to potentially sacrifice your own children for the abstract sake of a country that is not even yours is inherently wrong. In fact, shortly after they are united, brought upon by press and diplomatic pressure from the US (again underscoring the important weight and position of this family), his father sends him to a boarding school. This kind of relationship is an issue with Georgescu himself and his own children. As a father, he follows into the same footsteps or rather pitfalls as his own father, and his priorities are skewed. One must indeed make personal sacrifices to be successful in the world of business, and all of this comes at the expense of family. It is an unfair price to trade family happiness with money and success. Yet it is something that Georgescu himself does not embellish or gloss over; he acknowledges and realizes his own shortcomings and tries his best to rectify them. Based on his own upbringing, he used to believe that a child needs to earn the love of his parents, but now he realizes that it is unconditional love that makes one a parent and that if you do not have or cannot offer that, you should not have children in the first place. This type of epiphany may have been another, more personal reason for writing this book. So all in all, I enjoyed this book because it gives us a personal and honest glimpse of an interesting life. It inspires me and makes me think that maybe I should finish off my own memoirs, which are half-written and abandoned somewhere in a dusty attic of my computer files. It was also reassuring to know that there are people even in the higher echelons of the business world that are good and care about moral issues and that are ready to share their ideas in the form of such an entertaining and enlightening book.